I feel like I truly am a child of the internet. When I was born the internet simply did not exist, and over my 25 years, I have seen its rise in our lives from something that was a nice convenience, to an indispensable part of my daily routine - increasingly so since I have started this journey as a "style" blogger. While it seems that my tickets to Fashion Week were lost in the mail this year, I was able to sit front row to many shows while snuggled up on my couch, through the amazingness that is live streaming. Technology bringing me closer to fashion. My phone, laptop, and camera have almost become fixations on my body and I am always looking for new and fashionable ways to organize my tech gear. Fashion bringing me closer to technology. While my dream of having sunglasses with a built in camera is not currently available, there are some amazingly stylish accessories out there that make lugging my necessities around trés chic. HP is currently running an amazing contest where you can help pick out the new bag design for the ultra sleek and ultra fashionable HP Ultrabook™. The top 40 designs have been chosen, and now it is your turn to vote for the winning look! Along with the fierce panel of judges: Mondo Guerra, winner of Season 8 "Project Runway", Jill of Inhabitat.com, and LinYee Yuan, Executive Editor of Core 77, you can vote for the design winner and be entered to win $10,000 and a HP Spectre XT Ultrabook™, Inspired by Intel! What is your favorite convergence of fashion and technology? 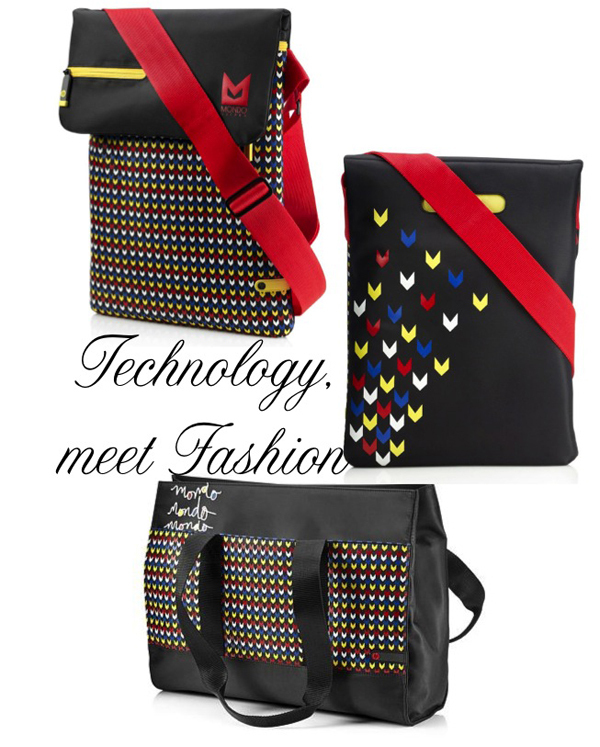 What makes your technology more fashionable? totally voted! i love that envy bag! this is so cool, jessica! what a cool opportunity!